Here at OFS we have taken one of our not so good looking cubicles and gave it a makeover. 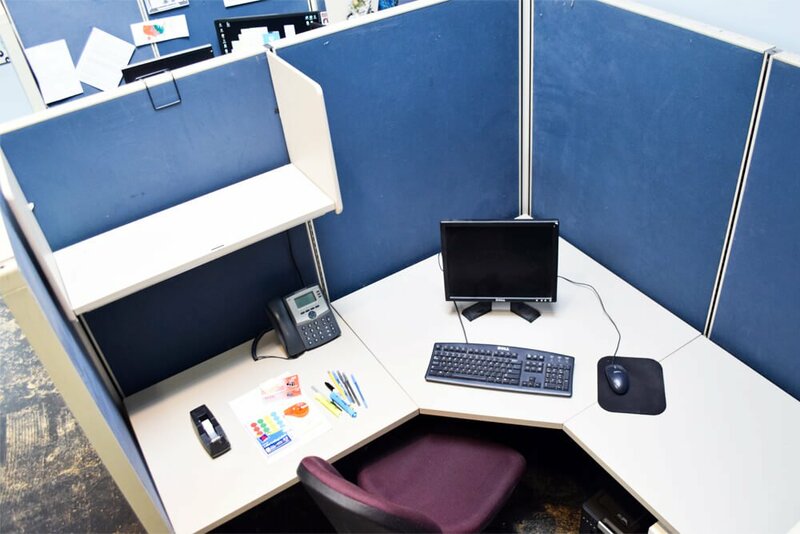 All of the items in the cubicle are DIY projects made by Clara and Jen. 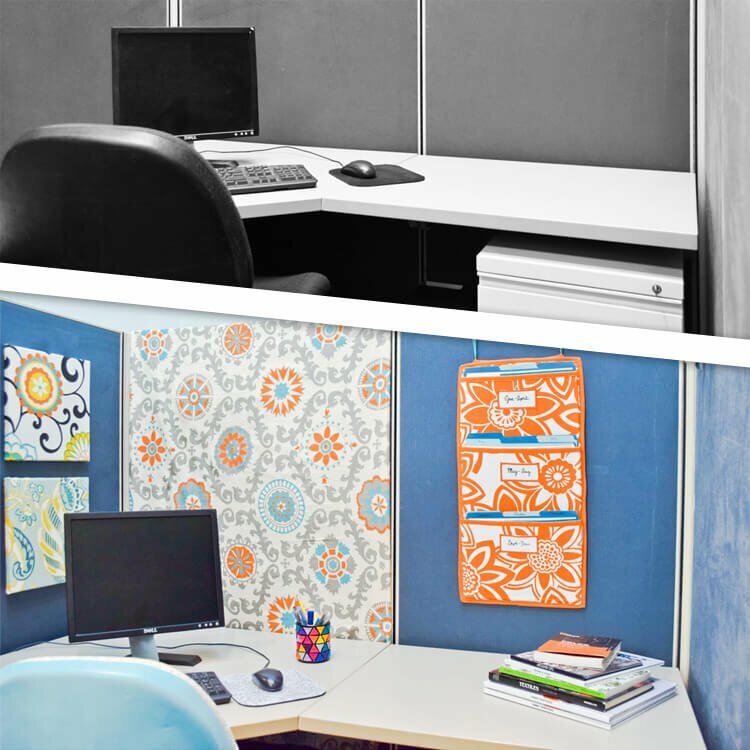 We were inspired to do this makeover after realizing how bad this cubicle was and also realizing how easy it would be to give it a makeover with DIY fabric inspired projects. 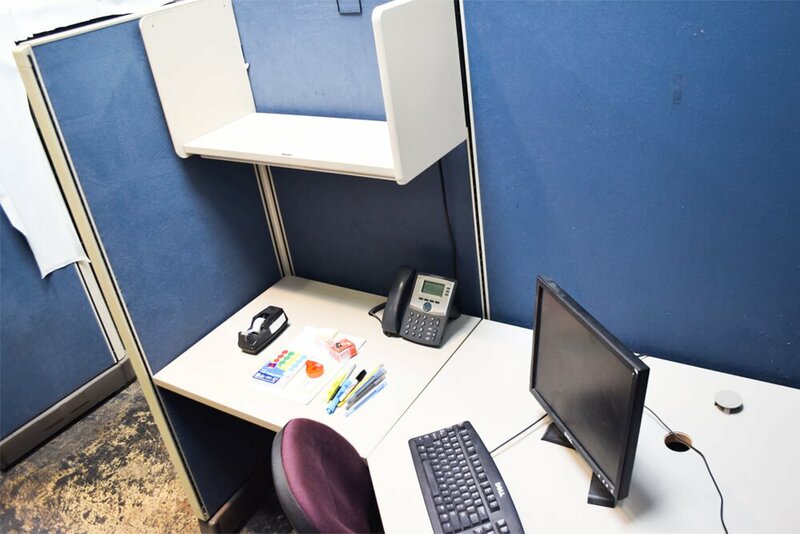 Below are before and after photos of our transformed cubicle space, and the individual projects that are featured! 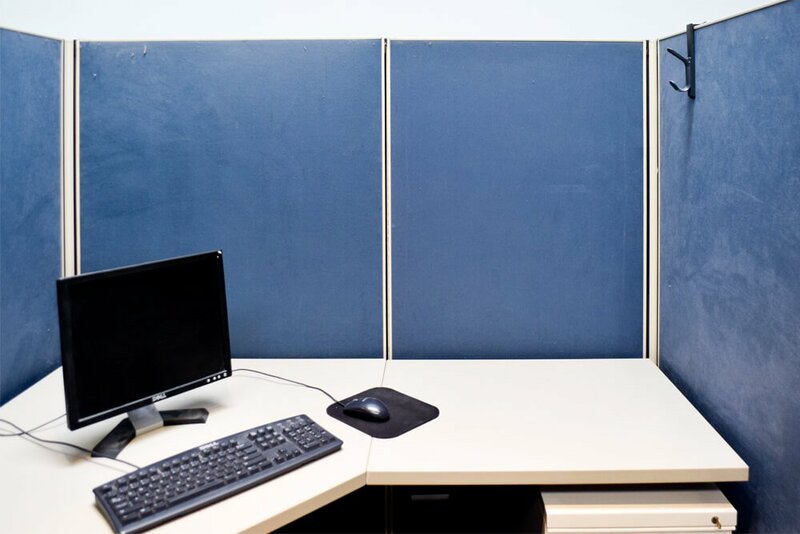 If you’re looking to give your cubicle a makeover, make sure to check out our selection of décor fabric. Our cubicles are a country blue color with high walls. It can get dark with the color and the height of the walls which is why we decided to add some colors and prints to help spruce it up. The colors we decided to go with were mostly orange, purple, and blue, with a touch of yellow. 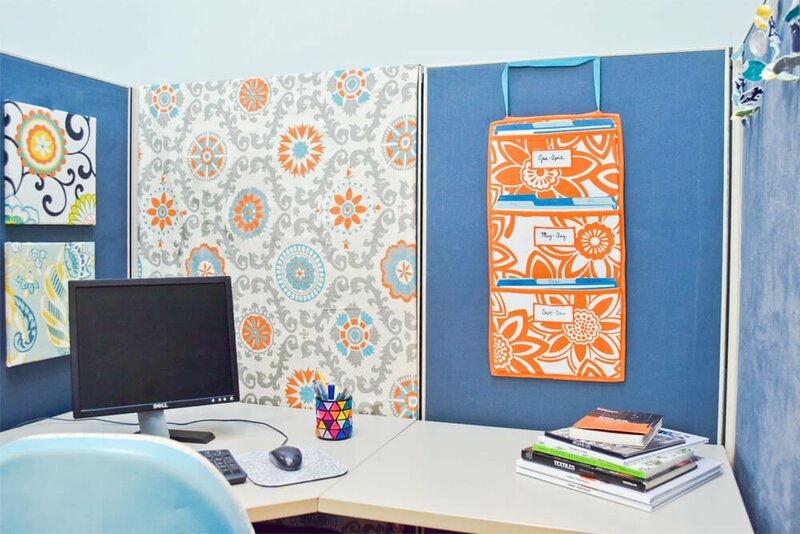 We used 1 yard of Premier Prints Rosa Mandarin Dossett Fabric to cover one panel of the cubicle wall. This adds more color and design on the walls without being overdone. 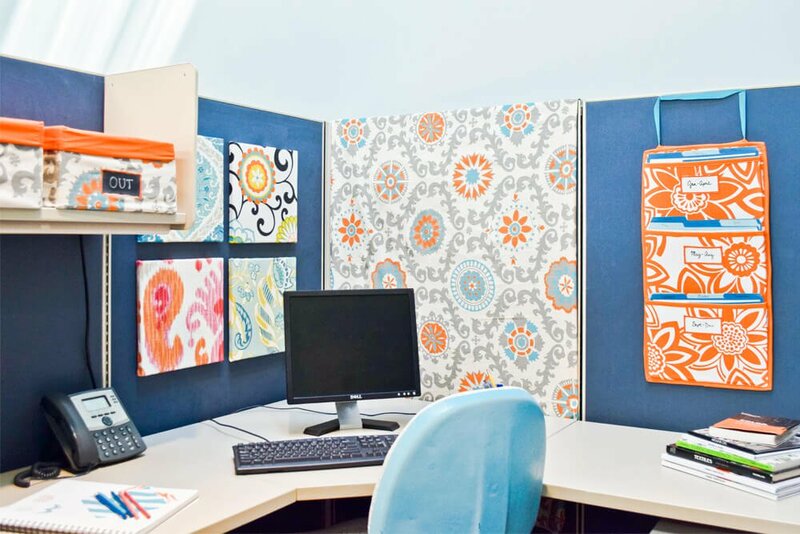 We created how to’s for all the DIY projects created for this cubicle makeover. Check them out below! This felt pencil holder might be the most colorful item in the cubicle. 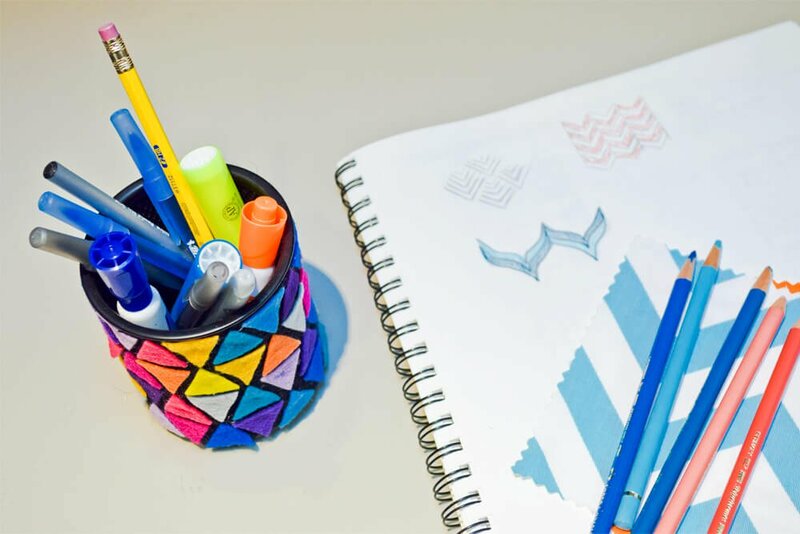 It’s geometric shapes and bright colors make a boring pencil holder more fun for decorating. 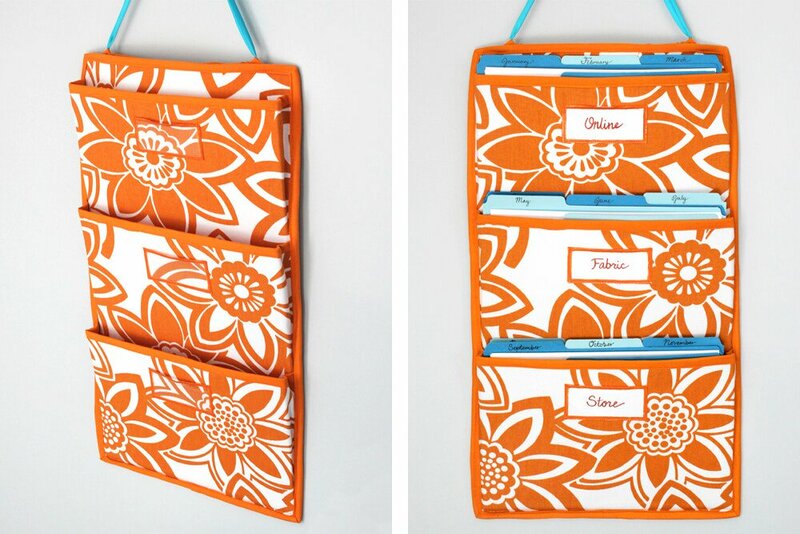 If you want to keep organized, then try making this hanging pocket organizer to help keep all of your files and papers together. It even has small clear tabs to use for labels! 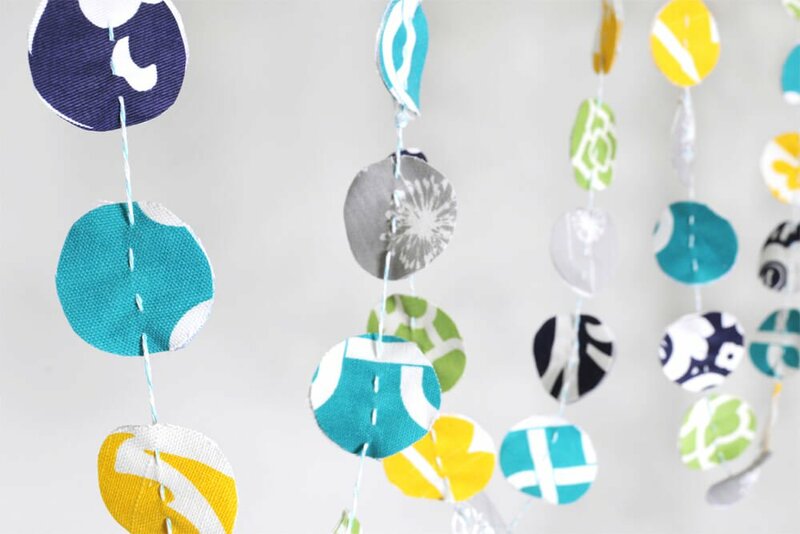 Fabric garland is not an office necessity, but it sure does make an office look fun. You can choose any colors and shapes you want! We draped ours on the wall in our cubicle to add a little decor to the wall. 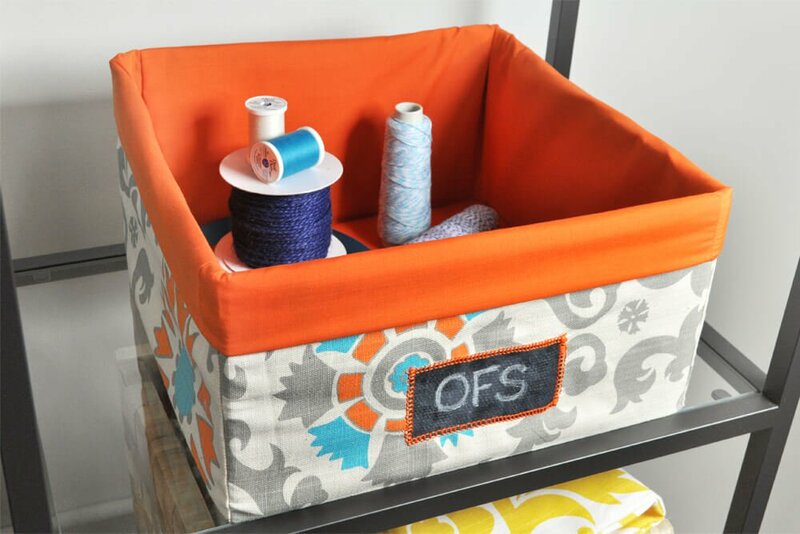 Another great way of keeping organized is making your own fabric storage bins. Just like the hanging pocket organizer these too have label inserts to help with organizing. These work great in any space! To add more decor to your walls, try making this fabric cork board that can hold photos and notes. You can use the ribbons for holding things in place or thumbtacks that can be pressed into the cork board. 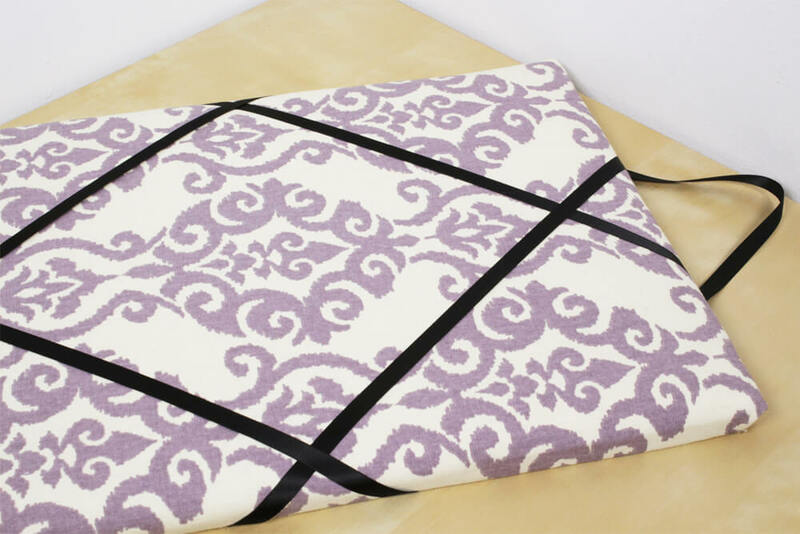 A fun project to do for any room is fabric wall art. 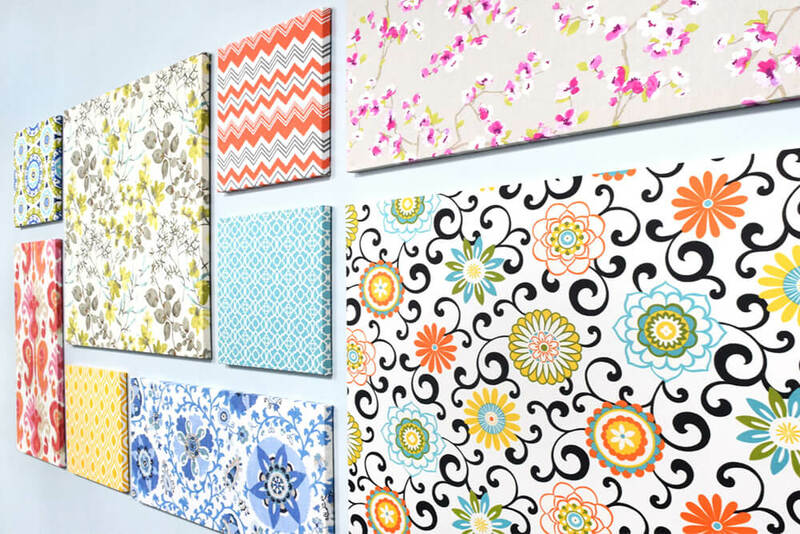 With this you can mix and match prints, colors, and sizes to create fantastic wall art. We used different patterns, colors, and shapes that were strategically placed in an order to create a design on one of our walls here at OFS. Probably the most stand out project of our office cubicle makeover was the re-upholstered office chair. We used Rust-Oleum spray paint to cover the scratches on the back of the chair and to also give it more color. Every office chair is different, and some are more complicated than others to re-upholster. 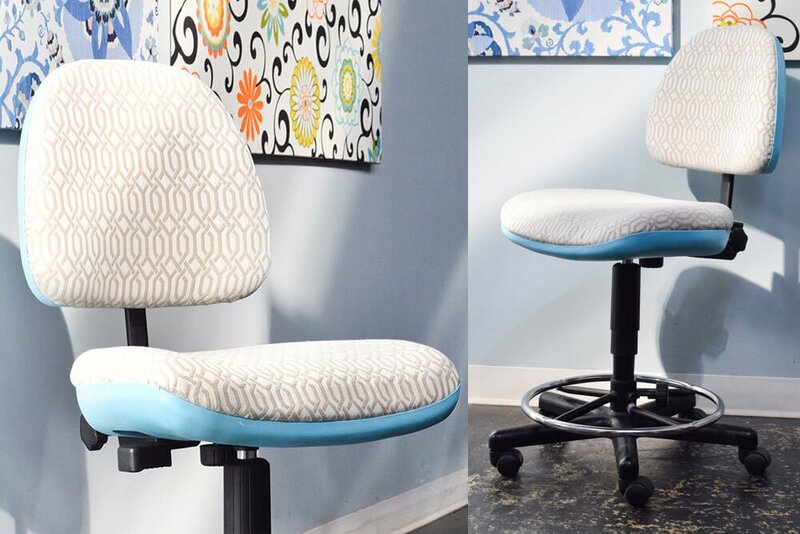 If you think your office chair will be easy to re-upholster than you have to check this tutorial out! 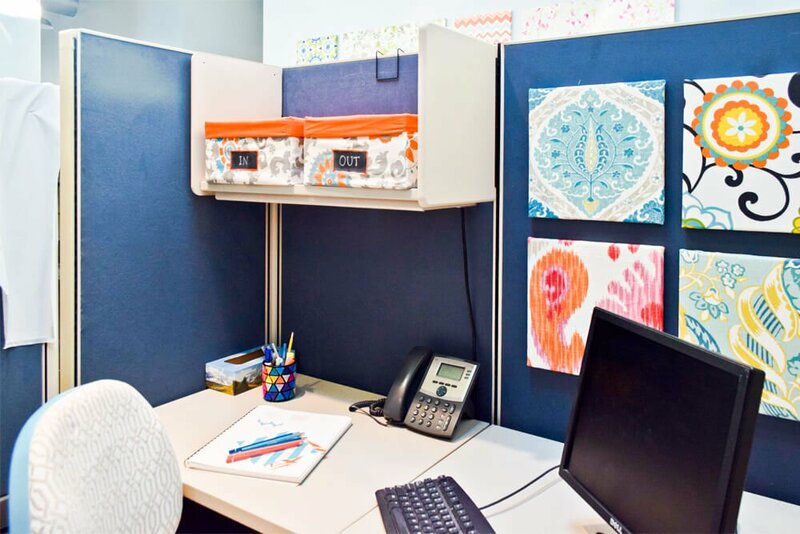 Probably our easiest project that we made for this cubicle is the no sew oilcloth mouse pad. It’s super easy and quick to make. 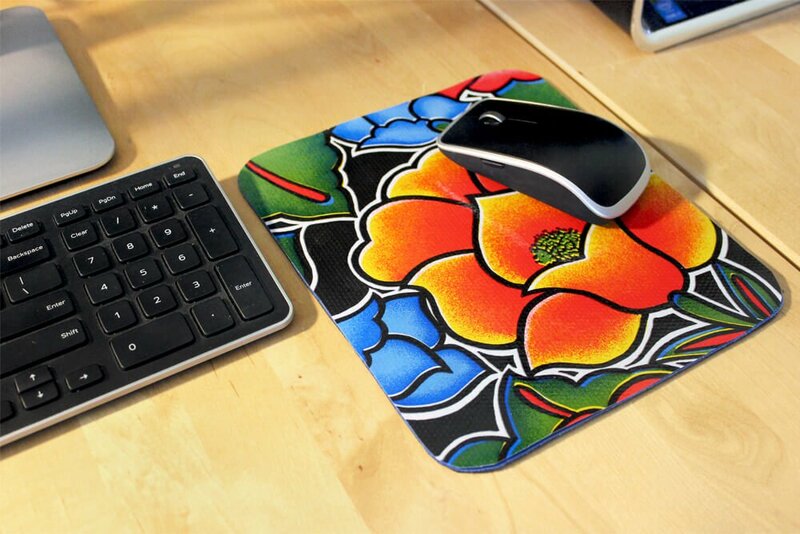 It can also give a boring looking desktop a pop of color. Try it out! To see more creative projects click here.